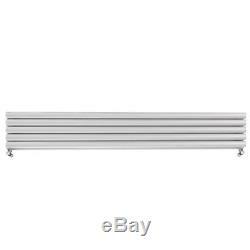 HB Signature Omega Axis White Horizontal Designer Radiators. Manufactured in accordance with BS EN 442. Supplied with wall mounting brackets and fixings. These simple yet sophisticated designer radiators from the Heating Boutique's Signature collection are more than just a stylish feature. Offering high-performance heat outputs of between 1320 watts and 2364 watts, our contemporary steel radiators are packed with a high capacity of heat retention to deliver an abundance of warmth to a happy home. Double panelled and available in a variety of height and width configurations to suit different rooms, they are incredibly easy to install. You'll be enjoying their service for many years to come thanks to their fantastic reliability, as well as our complimentary 15 year guarantee for HB Signature series products. Additionally, the HB Signature Omega Axis White Horizontal Designer Radiators have received EN-442 accreditation, ensuring that both British and European standards of quality and safety have been met. Made from quality steel and finished in a white gloss, our sleek Horizontal Designer Radiators are the perfect contemporary successor to their dated counterparts. Range of standard and thermostatic valves available separately. Designer Radiators and Single or Double Panel - Explained! Rest assured the Designer radiators have been manufactured to combine both functionality and stylish design, so you wont go cold in the winter months. Unlike Column and Convector Radiators, a lot of the Designers come in Horizontal or Vertical Orientation. The Verticals can be the perfect solution when trying to maximise wall space in your home, while the Horizontals are modern and stylish, but more traditional in orientation and release heat in the same method as the convector radiators do. Whereas, a Single Panel Radiator only has one panel which faces away from the wall. Because the design puts one panel behind the other, the height and width of the radiator will stay the same whether you choose single or double panel. Compared to the Single Panel options, the Double Panels will produce more heat because they have more surface area to warm the air in the room. You should bear in mind that this extra heat from a Double Panel will come at a higher cost. Heat Output BTU (Delta T50). Heat Output BTU (Delta T60). Heat Output Watts (Delta T50). Heat Output Watts (Delta T60). 1600mm x 290mm Double Panel. 1600mm x 348mm Double Panel. 1600mm x 406mm Double Panel. 1600mm x 464mm Double Panel. 1800mm x 290mm Double Panel. 1800mm x 348mm Double Panel. 1800mm x 406mm Double Panel. 1800mm x 464mm Double Panel. Please allow extra time if you are paying by cheque. Or you can collect from us. We cannot be held responsible for wasted tradesperson visits and charges incurred as a result. SPECIAL ARRANGEMENTS FOR COURIER DELIVERIES. When your order arrives, you will be asked to sign to say that you have received the goods and that they are in good condition. Please check both the external packaging and the product inside for any damage. We will arrange for a replacement item to be delivered to you as soon as possible, at which time the damaged item will be collected and taken away by the driver. SPECIAL ARRANGEMENTS FOR PALLET DELIVERIES. The drivers are only insured to deliver goods to the curb and are not required to carry goods into your home. If you find any damage, please sign the pallet as'DAMAGED' and the driver will take the damaged pallet away. If you are having multiple items delivered and only some are damaged, please sign'DAMAGED' for the goods that are damaged. If someone else will be signing for your goods. If someone else is signing for the goods on your behalf, you agree to ensure that your nominated signatory checks the goods prior to acceptance. Choosing the right accessories for your new Radiator or Towel Rail. The type of valves that you need will depend on the configuration of your pipework. If the towel rail / radiator has connections at the bottom. You will need either angled or straight valves. Angled if your pipes are coming from the wall as this will provide a 90 degree angle up into the bottom of the towel rail / radiator, straight if your pipes are coming from the floor and just need to go straight up into the bottom of the towel rail / radiator. If the towel rail / radiator has connections at the sides. You will need either angled or corner valves, angled if your pipes are coming from the floor as this will provide a 90 degree angle into the side of the radiator. Corner Valves if your pipes are coming from the wall this will also give a 90 degree angle into the side of the radiator however is the neatest solution with this type of configuration. The item "Gloss White Horizontal Designer Radiators Central Heating 15 Year Guarantee" is in sale since Friday, November 3, 2017. This item is in the category "Home, Furniture & DIY\Heating, Cooling & Air\Air Conditioners & Heaters\Radiators". The seller is "essentialshoppinguk" and is located in Colchester, Essex. This item can be shipped to United Kingdom, Ireland.